I finally got the left-hand end of the yellow birds finished and sewn on. This leaves me with something about 60" wide, but only about 50" high, so I am going to add on to the top and the bottom, until it is nearer to square. I am going to use up some of the extra flying geese units, and a couple of pockets, and little bits and pieces to get things all the same size. This gives you the general idea, though obviously I need to level off the bottom and the orange-y strip isn't sewn on at the top, so it won't be quite that wide. Some of my geese are much smaller than others, but rather than wasting them I am sewing them into pairs and then adding scraps across the bottom - the two in the left-hand corner are trimmed down already. I think this will all look okay once it's done. This is so beautiful and I love the colors. Thank you for sharing the process as well as the quilt pics. Yes to adding those pieces! 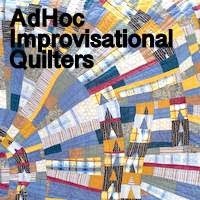 This is such a cheery and immensely fascinating quilt! It definitely makes me feel like tweeting and singing. Let the sun shine in! I think it's one of my favorites! I love the colors and happiness that exudes from the quilt. It's stunning! Oh yes, looking wonderful, a truly happy quilt! I enjoy watching this quilt come together. So many details to love from your first pull to these final border sections. Thanks for sharing your sunshine. Just love it and today it matches the gorgeous sunshine we have in real life! !